Remember spitting on a love bush and hoping it grows, mine never did. Or getting a cold and having your mom or gan-gran give you quailed leaf of life that tasted awful but did the trick in no time. Be it known or not many of our favorite and not so favorite foods and herbs have many alternate medicinal uses. Check out just a few and yes there will be more. A native to tropical West Africa in Cameroon, Gabon, Sao Tome and Principe, Benin, Burkina Faso, Ivory Coast, Ghana, Guinea, Guinea-Bissau, Mali, Nigeria, Senegal, Sierra Leone and Togo. Its name is derived from the West African Akye fufo. 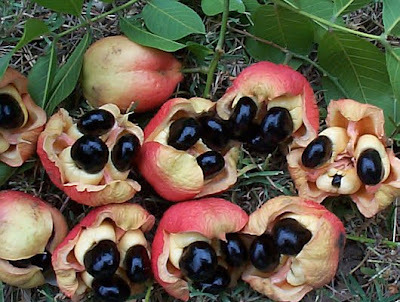 The term ackee originated from the Twi language. Other names and variant spellings include Ackee, Akee, Akee apple, Achee, or vegetable brain. As stated above the tree is not endemic to the West Indies but was introduced from West Africa during the 18th century. The plant was named Blighia sapida in honour of Captain William Bligh who in 1793 took samples to Kew Gardens in South London and introduced it to science. Although native to West Africa, consumption of ackee for food takes place mainly in Jamaican cuisine. Though it may be poisonous when improperly prepared, ackee has high nutritional value and is rich in essential fatty acids, vitamin A, zinc, and protein. Aside from being a very tasty national dish, Ackee has many different uses. The unfit fruit can be cut in half and used to wash clothes. For itchy skin and ringworm, the young fruit is crushed and a solution is applied to the skin as a treatment. 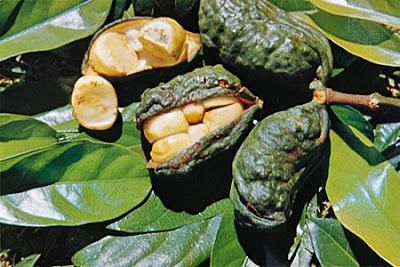 Kola nut (Cola) or the Jamaican Bizzy is a genus of about 125 species of trees native to the tropical rainforests of Africa. The kola nut has a bitter flavour and contains caffeine. Kola nuts are often used to treat whooping cough and asthma. The caffeine present acts as a bronchodilator, expanding the bronchial air passages. Bizzy is used to treat poison and is widely known by older persons and residents in the rural areas. It is said to be very effective, mainly because of its high tannic acid component. Besides being used to combat upset stomach, stomach pains and nerves problems, it is also used to purify the blood, treat eye inflammation, ease headaches, fight fatigue, depression, and as a beverage and/or tonic, in which case the dry Bizzy nut (seed) is grated, boiled, strained and drunk. For treating cuts, the seeds are grated and applied directly to the affected area. For bloodshot eyes, one branch is soaked in water for a few hours (or over night) then the liquid is use to wash the eye.